Thank you to all that came to the Meet the Trainers on November 24, 2015, especially the trainers. Brian Bausch with his horse, Russler, showing how special and entertaining a horse can be as together they performed several maneuvers that the rest of us only have dreamed of doing. Brian and Russler had been featured on America’s Got Talent. Also thanks to Brian for helping me with the m-cing duties as he has a great talent with that as well as with his horse. I want to apologize for the sound with my hand held microphone. I did not know how inadequate that was. It will be rectified before our next event. Thanks to J. J. Anderson and his filly, Mustang Sally, headed to the Mustang Magic competition in Fort Worth, Texas, in January, 2016. 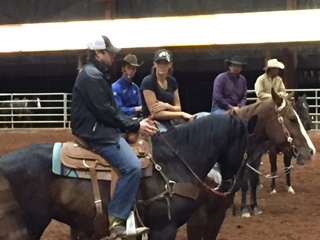 J. J. had already competed at the Mustang competition in Queen Creek, Arizona, in April, 2015. He finished in the top 10 with that mustang and was invited to participate at Fort Worth, Texas, in the Mustang Magic in January, 2016. J. J. had a limited number of rides on Sally, he demonstrated some leg yields exercises that build a foundation for Mustang Sally. I found it extremely interesting to see how an exercise that was good for this foundation in one situation, could be counter- productive in another. J. J. helping me out by showing the things Sally would do at home, in this new environment she seemed a little resistant. Ray had shared with me how Tom would tell him “ go ahead and work , but don’t work too hard.” I did not want J. J.’s effort to do something for me not be beneficial to Sally. Ray would say “adjust to fit the situation.” I stepped up and showed J. J. how he might continue the same exercise by making adjustments. Thank you to Buddy Uldrickson for bringing his ranch gelding that he had ridden a couple years. A very nice horse with a good carriage and attitude. Buddy showed some nice transitions as he talked about some of the things he had done with his gelding on the ranch. Buddy disclosed how he aspired to continue to bring up his performance level, but was cautious not to let him get too hot. We worked on some things in the down transitions that will make the horse more comfortable and willing to stay quieter. I thank Buddy for showing how any horse, whether from a desire to raise the performance or a horse getting anxious around other horses, going fast, or with separation anxiety could benefit with this insight. Thank you to Heather Herdt and her horse George. Heather and George bring an amazing resume and history. I could see Heather was a talented rider and had been very diligent and confident in her training technique. However, much of her technique was counter-diction to my teaching, but showing how with a good positive attitude developing a feel and timing for your aides, this could be affective. After watching her demonstrate with George, I shared with her, how I believed it would be beneficial to use her leg different and let her seat be more consistent for George to feel back to. At the end of the night, she set up the barrels and made a couple runs, she came back and told me how she recognized that she did use her seat more when they sped up. I agreed and advised her to bring that awareness to all of her riding. Colin Schroerder brought a horse that he had been working toward reining and roping. Colin concentrates his training with rope horses. Colin stated he had been mostly self- taught, looking to friends and peers. Colin had ask for insight for improvement in the horses turn around. The ability to have a horse turn around like a reining horse often becomes a measure of a trainer’s ability. When I met Ray Hunt, all of my horses had a great turn around on an inside leg. This did not carry much weight with Ray, he saw that type of a turn- around only had potential to be used to show out. A turn-around on the outside pivot foot had many purposes, like going around a barrel, going around the end of a gate, facing the head horse, and most important working a cow, “dubed the cow horse turn-around.” Ray admitted to turning around and staying on an outside leg, that you might have to sacrifice speed, but Ray said it would be appropriate to teach both. When I asked Ray if he was to show at a reining futurity, which would he use and he said outside leg, even though some speed might be sacrificed because of principal he would use the outside leg. I don’t know how much this information changed Colin or anybody that was there, but I am so thankful to Colin for the opportunity for me to share. I thank each of these trainers that came to this little event. I hope that because they stepped up to share and grow, that their status with the community they serve will recognize that they have a hunger to share and grow and seek them out for help with their horses.